The springs of the river Fiora fed, before they were destined to a network of aqueducts direct to the whole of southern Tuscany, a peschiera inserted in a highly suggestive tree-lined park, which completed the vast master garden of the Sforza-Cesarini, Lords of Santa Fiora in the aftermath of the fall of the Aldobrandeschi. Today the so-called Peschiera is still existing and is used, as well as for the breeding of trout and carp, also as a tourist itinerary. Suggestive the path to the discovery of the springs of the Fiora. 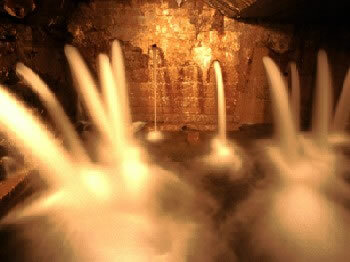 It travels over a kilometer inside the mountain and you are in a large cave where the aqua gushes from the rock. Here is born The Fiora aqueduct with a porter of about 700 liters per second.